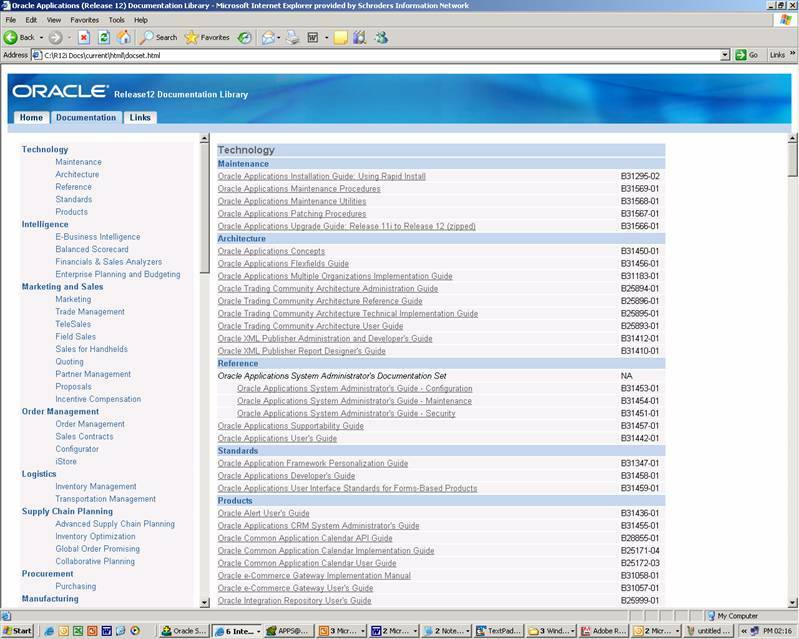 Today is 31st Jan, 2006, the day when oracle had schedule to release 5 different products across 6 continent, out of which one is Oracle application i.e. R12.Thus,I thought to bring this topic here, to let everyone know how oracle helps in understanding the evolution of ERP Suite in last 20 years. 14000 installations worldwide is a wildcard entry while considering for product evaluation by companies who are looking for some ERP product. I hope everyone is bit excited to know. These 9 years oracle has seen lot many achievement like becoming first DBMS based Database Company. They have released 7 different database versions with technology enhancement, and they become Public company as sometime 1986 had IPO in market. The start up has turned in recognized DBMS company, thus it was perfect time for them as well as Industry expert are looking Integration with in area like Finance , Manufacturing etc..Thus ERP evolution takes place. Some times in August 1987 Oracle started there Oracle Applications division, a group focusing and building business management software closely integrated with there own database software. Sometime in August 1988 they released there first ERP application called accounting system that has only general Ledger functionality enabled. This is one of the reason of having General ledger application_id is 101.Intresting.. The year 1997-98, the attention was primininlly focused on Internet, which already takes off in Information Technology sometime back. The concept of thin client was a baby at that time. This year oracle strategy shifts toward the internet and browser based development. The middle of year oracle launched and shipped there 11i product which was armed with 8i database, with lot many new features. In 2000, Oracle9i Application Server released at Oracle becomes the first database with middle-tier cache. This 9iAS leads to launches of E-Business Suite. The suite combined with all inbuilt products. 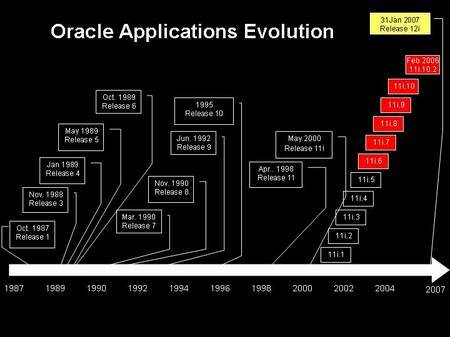 Since 2003 onward, oracle keep there attention on oracle application product and same time they make ready with departure of old 10.7 products, by simply de-supporting. These two year have seen acquisition and movement of oracle from DBMS to grid database, thus EBS suite does come out with MobApps, has feature of RFID and other need for manufacturing area. The year 2006 seen a release of yet another ..11.5.10.2 version. Oracle is ready with there new version ready to release in market. This times a new member i.e. R12. Finally the wait is over. Oracle has provided a link for R12 documentation. The download bundle consists of 408.08 MB file. Anyone can download directly from Oracle site. Amazing this time these documents has colour jpg/gifâ€™s that means readability is greatly enhanced. Isn't It. Wow!! A new headline for Release Content Documents would be appearing once you logged in Metalink. 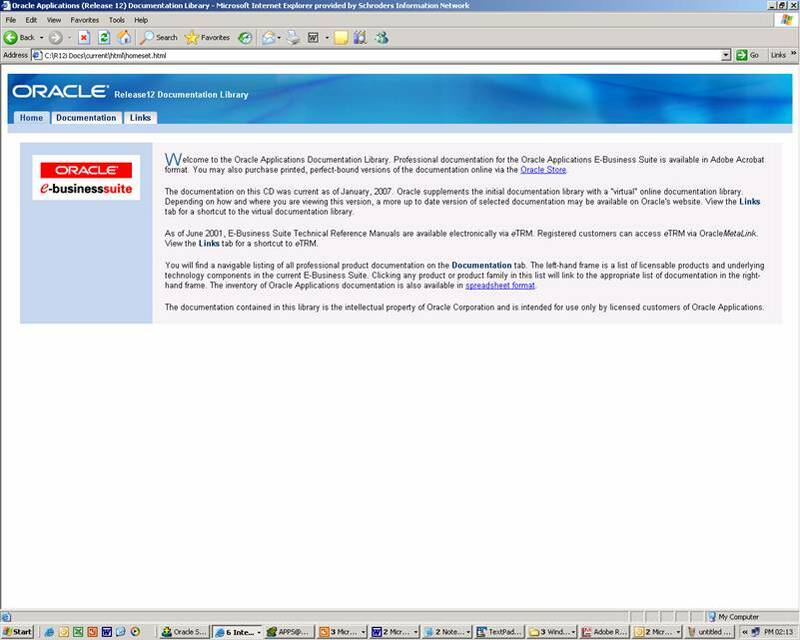 The document id 404152 describe with a note and the links for Release Content Documents of various Oracle EBS products. These documents mostly covered brief discussion for new and updated features in R12.Metalink user can access these documents and get the feeling of R12 before actual release which is schedule to be on month end. Take a note, these documents does not describe any existing functionally so, bit disappointed to those who are looking for comparative study. Online tracking of engineering change orders with electronic routings for approvals. System generated BOM's and routings for configured products. System generated production schedules from MRP module. Automatic yielding for finished goods and BOM components/ingredients. Where used and mass replace capabilities. System generated work orders for make to order environments. Fully attributed inventoryÂ from order entry through production and shipping. Online order promising by exploding the multi-level BOM, reviewing BOM stocking levels, and production space. Online messaging for production managers on plant floor exceptions. Integrated dashboards for management's KPI's. Thus it is important to find balance between this industry sector nuance and a Basic ERP system .Â he too agreed that basic ERP functionality Â are often lacking when the focus is too heavily on the bells and whistles.Â In his paper he strongly agree by Gill idea that he felt , â€œMany vertical ERP applications in the food sector lack strong financials and must integrate with bolt-on third party systems.â€Â The ERP functionality should also include complete multi-company, multi-currency, and financial reporting capacity. Â Process Manufacturing â€“ Enables traceability throughout the entire manufacturing cycle with recipe management, production scheduling, process execution and inventory management. Â Trade Management â€“ Organizes and tracks marketing and sales trade promotions, deductions, and budgets. Food Safety and Compliance â€“Supports full accountability tracking at each step of the process. Also, I would like to share some of EBS 11i.10 enhancements like Scarce inventory allocation, lot/serial receiving, better controls for Food and Drug Administration (FDA) 21 CFR Part 11 compliance and an improved channel/partner management dashboard has been targeted for faster communications. at MEAI's parent company in Japan. Oracle Procurement, Oracle Financials, Oracle Order Management and Logistics the areas which covered within the scope. a news paper reported. Last quater of year 2006 sees boost in economic in North America, Europe and South Asia.The drastic growth of execution of some of the projects in ERP segment is beacuse, as many companies are planning to implement a new or expand an existing ERP solution in the near term. The predication of the ERP market is expected to grow 8 percent until 2008.For midsized corporations, government agencies, and industries such as health care are expected to lead the spending on ERP implementation, a web site reported. The leading ERP system providers are SAP and Oracle/PeopleSoft.